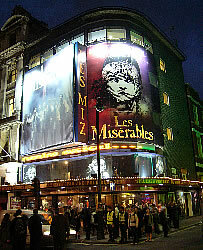 Guide to the London stage musical "Les Misérables"
This page is a brief guide to the stage musical Les Misérables (prounced "lay-miz-ay-rar-blur"), which opened in London's West End in 1985. It is currently being staged at the Queen's Theatre. The Queen's Theatre is at Shaftesbury Avenue, London W1D 6BA (nearest Tube: Piccadilly Circus or Leicester Square). It is located at the junction of Wardour Street and Shaftesbury Avenue (the A401). Jean Valjean is released after 19 years of hard labour in a prison camp in Toulon. He had been arrested after he broke a window and stole some bread for his sister's sick child. As a prisoner he was called by a number: 24601. His chest has been branded (marked using hot iron). He expects to be free and to live a normal life again, but instead he is told he must carry a yellow card which identifies him as a former prisoner. The Bishop of Digne, seeing him in despair, welcomes him as a guest, giving him food and lodging for a night. Valjean steals the silver plates during the night, but is caught by the police. However, the Bishop tells the police that he had given the silver to him, and even gives him two silver candlesticks which he had left behind. Seeing the bishop's kindness and trust, Valjean decides to forget his past and to start a new life. He runs away from the town. 8 years have passed. Valjean has worked hard to become the owner of a factory in the northern French town called Montreuil-sur-Mer. He has changed his name, and has been appointed as the town's Mayor. One of his factory's workers is a lady called Fantine. A few years earlier Fantine had a summer love affair and become pregnant, but the man abandoned her. She gave birth to a daughter called Cosette. However, she could not afford to look after her, and paid an innkeeper and his wife to look after her. Cosette is now sick, so the innkeeper has written to tell her to provide money for medicine. Another worker steals the letter and discovers Fantine's secret. Fantine is thrown out by the factory's foreman, who is angry with her because she has refused his attempts to seduce her. Fantine needs money, so she sells a locket and some of her hair. She then becomes a prostitute. When she refuses to sleep with a customer, he accuses her of attacking him and calls the police. The policeman Javert comes to arrest Fantine. However, Jean Valjean arrives and insists that Fantine, who has caught a disease, should be taken to hospital instead of prison. A heavy cart which has become loose runs over a man. Jean Valjean uses his great strength to release the man from under the wheels. Javert is reminded of the strength of prisoner 24601, and says that this man has just been arrested. Jean Valjean cannot accept that an innocent man will be made a prisoner instead of him, so he admits that he is prisoner 24601. Jean Valjean goes to hospital to see Fantine. She is dying. He promises to find her daughter Cosette and to look after her. Javert arrives to arrest Jean Valjean, who asks for some time to find Cosette and keep his promise to Fantine. Javert refuses the request and tries to arrest Jean Valjean, but he escapes. Jean Valjean travels to the town of Montfermeil. The little girl Cosette is being treated cruelly and is forced to work like a slave by the landlord and his wife (the Thénardiers). The landlord's own daughter Eponine is being looked after much better. Cosette doesn't know her background, but has memories of being treated kindly as a baby. She wants a happier life and to be loved. 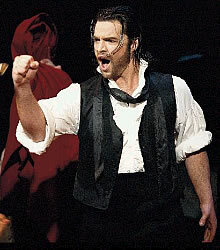 Jean Valjean gives money to the landlord to take Cosette away. Jean Valjean and Cosette have moved into a house in Paris at 55 Rue Plumet. The Thénardiers have also moved to Paris, where they organise a street-gang. This gang attacks Jean Valjean and Cosette, but they are rescued by Javert (who doesn't recognise them). Marius meets Cosette, and immediately falls in love with her. Marius asks Eponine to find Cosette and take him to see her - she agrees to do this, although secretly she is in love with Marius. 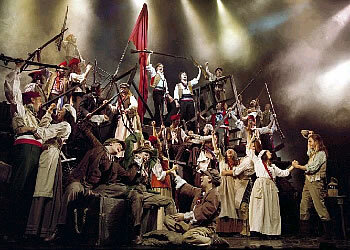 Eponine stops her father's gang from robbing the home of Jean Valjean and Cosette. 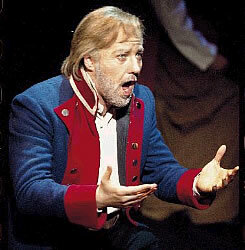 Jean Valjean thinks that Javert has found him and has come to arrest him, so he prepares to leave Paris. 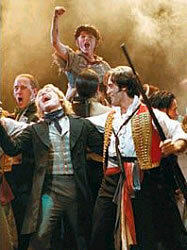 Enjolras is the leader of a group of idealistic students. He encourages his friends (including Marius) to prepare for a revolution. The news arrives that the popular leader General Lamarque, the only one who cared about the poor, has been killed. Enjolras decides this is the time to take action. At the end of the first act all of the main characters consider how much their lives will change after just one more day. The students start to set up a barricade in a road called Rue de Villette. They are joined by Eponine. Marius gives Eponine a letter to take to Cosette, and asks her not to come back to the barricade. Jean Valjean sees Eponine near his house and receives the letter from her, saying that he will pass it on to Cosette. Secretly he reads the letter himself, learning about Marius' love for Cosette. The French army warns the students to surrender or die, but they ignore this and remain at the barricade. Javert is a police spy and tries to give false information to the students, but Gavroche recognises him and he is made their prisoner. 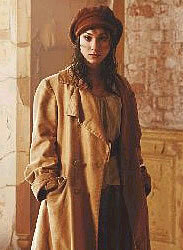 Eponine returns to the barricade, because she wants to stay close to Marius, but when she is nearly there she is shot. Marius finds her and she dies in his arms. Jean Valjean goes to the barricade to try to help Marius. 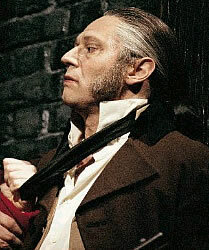 He is allowed to decide what to do with the prisoner Javert and, instead of shooting him, decides to let him go free. Gavroche goes out to find more ammunition for the students, but on his way back he is shot. The army attack the barricade and they are all killed except for Marius, who is unconscious. Jean Valjean finds him and carries his body away, escaping by going down into the sewers. 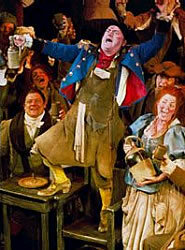 Thénardier, who has been robbing the dead bodies, sees them there and takes Marius' ring. When Jean Valjean comes out from the sewers he is found by Javert. Jean Valjean asks to be allowed time to take Marius to hospital. Javert decides to let him go. Javert has been moved by Jean Valjean's compassion for others and by the mercy which he showed to him when Javert was a prisoner. His beliefs about justice have been shattered, and he kills himself by jumping into the River Seine. Marius recovers in hospital, where Cosette is helping to look after him. He doesn't know who saved him. Jean Valjean tells Marius about his past, and explains that after he has married Cosette he must leave them, so that he will not bring trouble for them in the future. Marius and Cosette get married. At the reception party afterwards Thénardier attempts to blackmail Marius, telling him that Jean Valjean is a murderer, and producing the ring which he had taken from the body as proof of this. Because this ring is Marius' own ring, Marius understands that it was Jean Valjean who had rescued him. Marius and Cosette go to see Jean Valjean. Jean Valjean tells Cosette about her mother Fantine, and then dies. His dead body is joined by the spirits of all of all of the other poor people who have died: Fantine, Eponine and the students who were on the barricade. 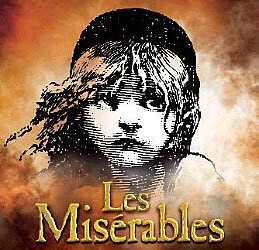 This musical was based on a book by the French writer Victor Hugo. Toulon is Frances second most important naval port. During the 17th and 18th centuries it was famous for its galley slaves, who were chained to the decks. When the galleys were abolished the slaves were put into jail. Not far away up in the mountains is the village of Digne. Hugo heard a story of Digne's bishop, Monseigneur de Miollis, who took in a released convict for the night, and when the convict repaid the bishop by stealing us silver dinnerware, de Miollis told the police that he gave the treasure's to the man. Montreuil-sur-Mer is a small town in north-west France, in the area called Pas-de-Calais - near Le Touquet. Montfermeil is an area in the eastern suburbs of Paris. This is the location of the inn where Cosette was brought up by the Thénardiers. The original book of the musical is by Alain Boublil and the music is by Claude-Michel Schönberg. 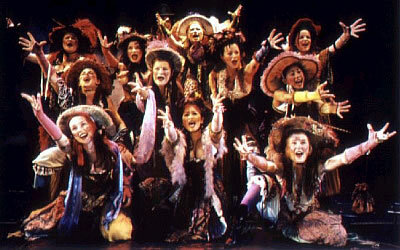 Boublil and Schönberg also made the musicals Miss Saigon, Martin Guerre and The Pirate Queen. The lyrics were written by Herbert Kretzmer, who also worked with the French singer Charles Aznavour and helped to create famous songs such as "She". Publisher: Applause Theatre Book Publishers,U.S. Some of the vocabulary is listed below, in the order in which it is used in the show. There is a castle on a cloud. I like to go there in my sleep. Aren't any floors for me to sweep. Not in my castle on a cloud. There is a room that's full of toys. There are a hundred boys and girls. Nobody shouts or talks too loud. Not in my castle on a cloud. She nice to see and she's soft to touch. She says "Cosette, I love you very much ..."
[One day more] I didn't live until today. How can I live when we are parted? There's a grief that can't be spoken. There's a pain goes on and on. Empty chairs and empty tables. Now my friends are dead and gone. Here they talked of revolution. Here it was they lit the flame. English: If you are not a native English speaker you may find it difficult to hear all of the the words of the songs. You may find it helpful to read the story outline above and to check the vocabulary, as this will help you to follow the story. The music, staging and emotions can be appreciated by everyone. Age: Adults will enjoy this production. Children may find some parts of the story difficult to understand (it is not recommended for those under 14, and children under 4 are not allowed into the theatre). Music: There is music throughout the performance.